I’ve always had a thing for toffee. Growing up, Skor bars were one of my favorite candy bars. My mom used to make Almond Rocca (something I’ve got to try making one of these days) and I loved it. You know how women get cravings when they are pregnant? Well, I remember craving Skor bars during one of my pregnancies. One day, we stopped to get gas and when Brian ran into pay (this was back in the “old days” when pay-at-the-pump wasn’t always available) he asked me if I wanted anything. I asked for a Skor bar and he came out with a Heath bar since the gas station didn’t sell Skor bars. And if you know anything about the cravings of a pregnant woman, you will understand why that didn’t work for me. So, my wonderful husband found me a Skor bar from another gas station. I can’t remember if it was that same day or soon afterward, but I know the whole ordeal was a little mind-boggling for him. I’m not sure what the difference is between Skor bars and Heath bars. They are both owned by Hershey’s and they are both toffee covered with chocolate. Do you prefer one over the other? 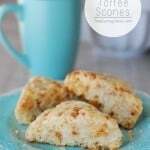 So, going along with my love for toffee, I decided to add toffee to another one of my favorites: scones. 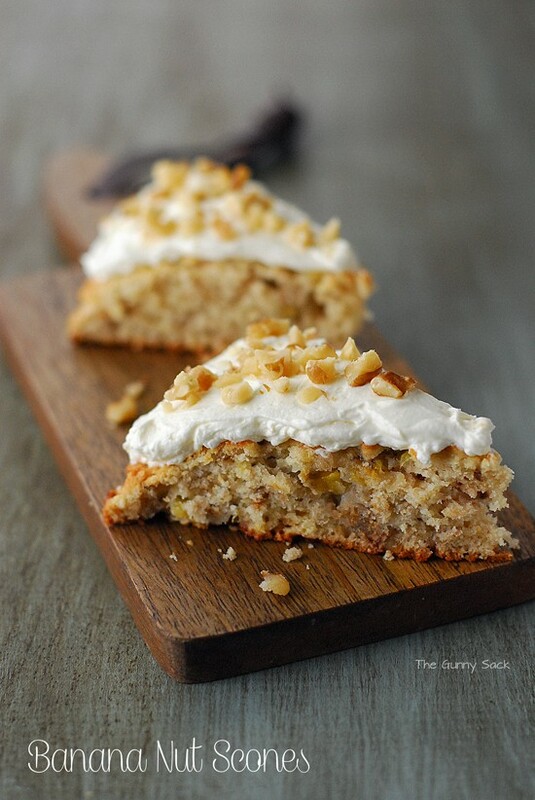 The soft, fluffy texture of the scones and the sweet crunch of toffee were perfect for enjoying with a cup of coffee. Cut cold butter into slices and add to flour mixture. Cut butter into flour mixture with a pastry blender or two knives. Mix in half 'n half, egg, cream cheese, vanilla and toffee bits with a fork until mixture comes together. Gently gather dough into a large lump. Divide dough in half and gently form into two 8 inch circles on a greased cookie sheet. Cut into 8 wedges with a long, sharp, floured knife but do not separate the wedges. Bake at 425°F for 14 to 16 minutes until golden brown. I’m a toffee lover too….although I couldn’t tell you the difference between Skor and Heath! I’m pretty sure I love them both! 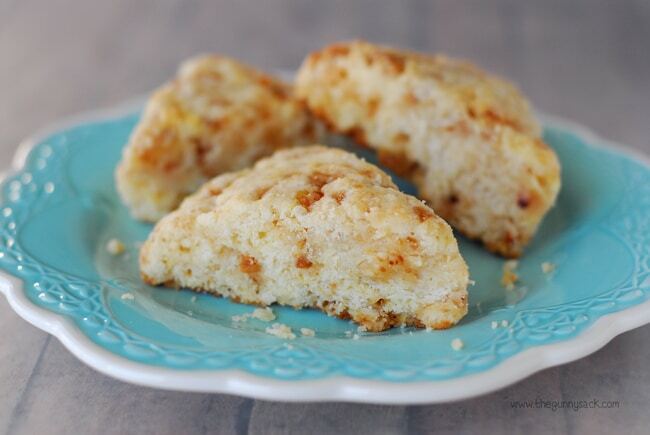 What a delicious idea for scones – a great way to wake up in the morning! 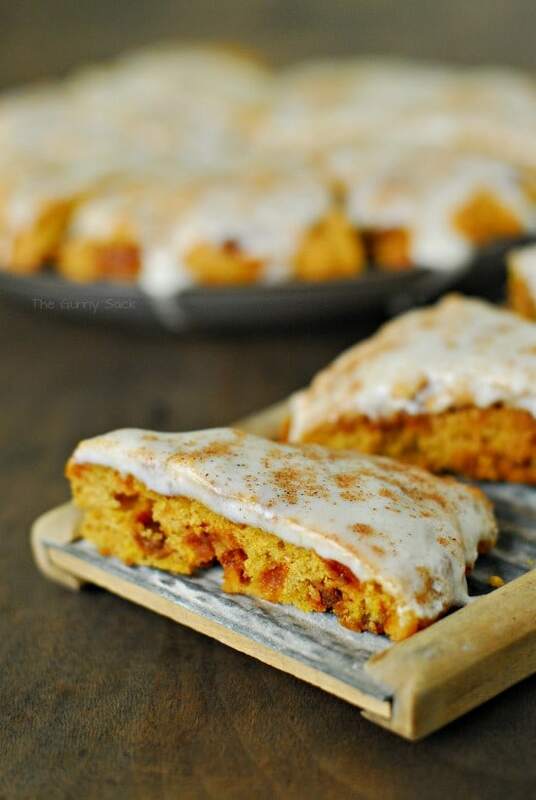 These look delicious, and I’d like to make them. Can regular cream cheese be used in place of the whipped cream cheese? Thanks! Yes, I would suggest that you soften it first so that it will be easier to mix in. Happy Baking! I finally got around to making these, and they are so good! I used 1/4 cup of regular cream cheese (whisked vigorously with the egg) in place of the whipped cream cheese. Also, I found a heaping 1/2 cup of the toffee bits was the perfect sweetness for us. Thank you for a terrific recipe which my husband has already requested again. Oh, I understand those cravings. I still get them. Like, coke and pepsi are NOT the same!! I want 5 of these scones. 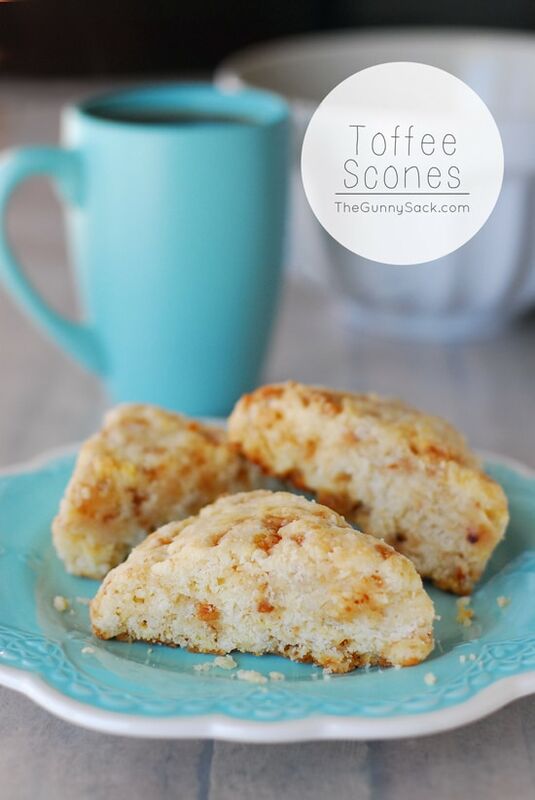 Great idea to add toffee to scones! These look perfect! Your scones look absolutely incredible! I am seriously in a state of yum!